I know in the midst of the cold winter that the Treasure Coast endured that I couldn't wait for the heat of summer to get here. It's here and I am one person that is happy to have summer weather back in the area again. Plan your fishing adventures right to get the best out of the fishing and beat the worst of the heat each day. I get out early and back before the hot afternoon sun sets in. It starts getting light around 6 am right now so you can get plenty of fishing time in before noon. Have some fun out there! Trout fishing remained the best bite of the week for us. Al Rodriguez and his family came up to spend a day in Fort Pierce. Al, Laura and the kids, Alexandra and AJ, had a fun day out on the Indian River and found a variety of species eating that day. They found trout up to 22" on the flats. AJ even added a nice sheephead for a dinner treat for the family. It was an enjoyable day on the water. 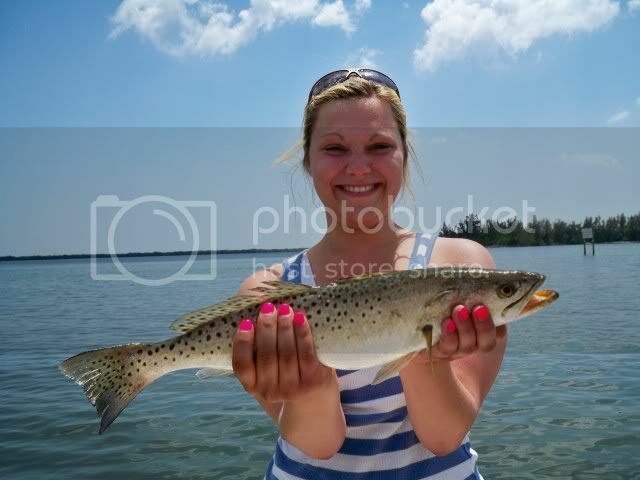 If you are looking for trout, try Harbor Branch, Queen's Cove and Round Island up north of Fort Pierce. Heading south, you can try around the west shore near the power lines. DOA Deadly Combos, CAL jerk baits and live shrimp will get you in on some of the great fishing action out on the river. Redfish are holding shallow in the middle of the day. DOA shrimp or CAL grub tails are good artificials when fishing shallow for redfish. I have been using the new Arkansas Glow shrimp and having good results. Snook fishing around the inlet and bridges will get better as the moon gets full. 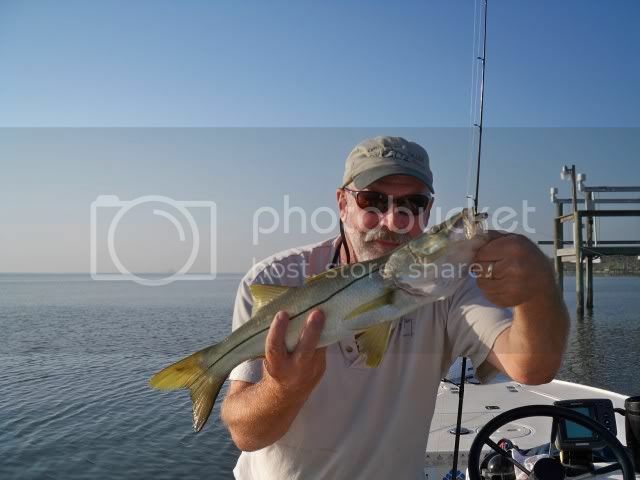 There are also lots of big snook hanging around the docks on the west shore. It's a great time of year to be fishing! Bridges have been slow lately, but there have been reports of margates being caught along with sheephead. Jetties have held jacks and mackerel for anglers using spoons. Whiting is still consistent along the surf. The tarpon are showing up along the beach now. This should be a great summer of fishing around the Treasure Coast! Memorial Day is the first holiday of summer and that means lots more boat traffic out on the waterways. Safety should be every boat operators first priority during this and any holiday weekend. With added traffic that means more congested areas for boaters to maneuver. Slow down and don't be in a hurry! Holidays are when I wish that everyone would take a safe boating course. Don't rely that the boat coming towards you knows what it is doing......many have no idea about Rules of the Road or Navigational Aids....etc. You are responsible for yourself and your passengers when operating a boat. Remember that alcohol will be more apt to be involved in lots more boats on holiday weekends and safe boating can make sure your boat is not a statistic or accident. I hope that everyone has a FUN and SAFE holiday weekend! AJ with a nice sheephead from the flats and dad, AL, with one of his trout caught on their fishing adventure with the family. Wonderful weather was in store for anglers this week on the Treasure Coast. Some windy days, but great fishing weather out on the Indian River. It might be hot out there, but I love fishing this time of year. Get out early and beat the heat or an evening trip can make for a great fishing experience. Just remember to drink lots of fluids and keep the suntan lotion on. Have some fun out there soon! 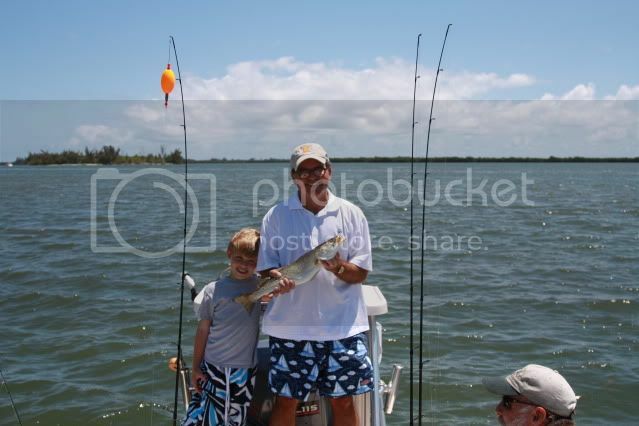 We found trout willing to bite up north of Fort Pierce this week. We tried a number of areas and found trout on each flat. Harbor Branch, Queen's Cove and Round Island to the north and around the docks to the south of Fort Pierce were all active with bait and the trout were out there feeding. Tom and Jim were out with me and they did well on trout with a few nice keepers. Both DOA Jerk Baits and Deadly Combos resulted in some good catches. Wayne, Grace and Ben found trout on another day on the river. Ben caught several nice trout up to 22 inches. We have been drifting the flats until we get a bite and that area for a while. Try fishing the shallows early and move to three to five feet later in the mornings to continue the bite. We found some redfish in small schools also this week on the flats. They were in one to two feet of water in the middle of the day. Keeping quiet and moving slowly can help out in finding some redfish that are willing to bite. Tom and Jim caught three and missed a couple others while fishing a DOA shrimp slowly along the flats. Tom even caught one while sight casting to one on the flats. The docks along Indian River Drive will hold redfish most of the summer. Lot of baitfish have entered the river and you will find some of the flats are teaming with fish. Bear Point has been loaded with bait on the days we have fished around there. Anywhere we have fished around the docks lately has also been full of baitfish on the flats. It's gonna be a great summer! Look for whiting along the beaches and some mackerel and jacks to be around the jetties. You should be able to find some tarpon around the jetties and off the beaches now as well. Have some fun and get out fishing soon. As summer begins to bake the days along the Treasure Coast. Make sure you use plenty of suntan lotion while out in the sun. The sun reflecting on the water will intensify the rays and you can get burned quickly out there. There are lots of brands and types, but get one that is waterproof and I recommend a higher SPF rating around a number 30 at least. It's better to re-apply during the day to make sure it keeps working. A couple minutes putting some lotions on can certainly reduce the risks of skin cancer and certainly keep you from one of those painful sunburns. Keep some in your tackle box or in the boat throughout the summer! 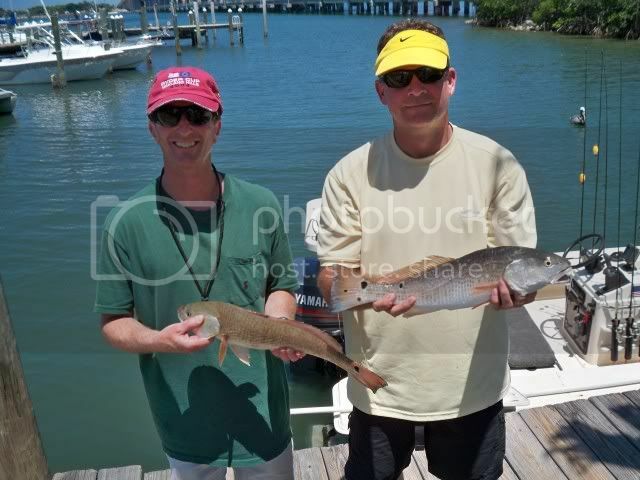 Tom and Jim with a couple of their redfish. 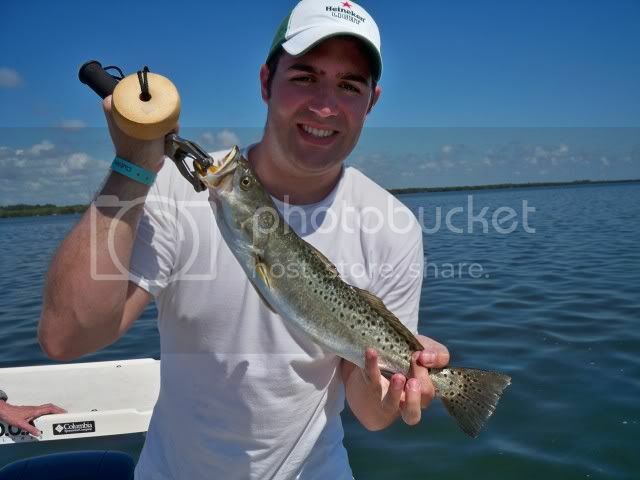 Ben with one of his trout caught on the Indian River this week. After taking a few days off to enjoy a short cruise with the wife, kids and grandkids, I was back on the water this week to fish the Indian River once again. Windy weather seemed to be the norm during the time we were away and it was no different back on the water. It has been fishable and the fish cooperated for us as well. The winds will be the norm for a few more days, but summer is fast approaching. It is a great time of year to fish! Steve Hughes and his fishing buddy, Ken, were down this way to do some trout fishing. We tried a couple spots before we found some trout willing to eat both live bait and artificials. Using DOA CAL 4" jerk baits, MirrOLures Mirrodines and DOA Deadly Combos, the guys limited out on nice trout with two above the 20" slot. In spite of windy conditions, the trout were on the flats. 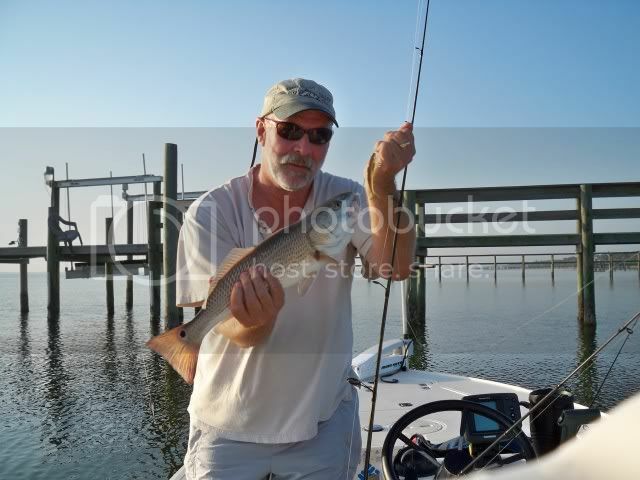 We caught trout around Harbor Branch, Queen's Cove and Round Island where we could manage the choppy waters. Trout continue to be the best bite with some redfish around the flats as well. We did lose one nice redfish on the flats. You will find some schools around the river in May and it will continue throughout the summer. Docks, when fishable, will be very productive the rest of the month. Snook fishing will be best at night around docks, jetties and bridges. Whiting will remain the steady bite along the beaches this month. It's been a good week on the water! As summer is fast approaching, it's wise to stock up on sun lotions and water each time you head out on the water. The summer sun can be brutal as the winds die down and being prepared for it can keep you cool and safe from the heat. Drink lots of fluids and make sure you periodically layer on the sun lotion. A few minutes can keep you from an ugly sunburn. Take a hat and sunglasses as well to keep yourself safe and cool in the hot weather ahead. 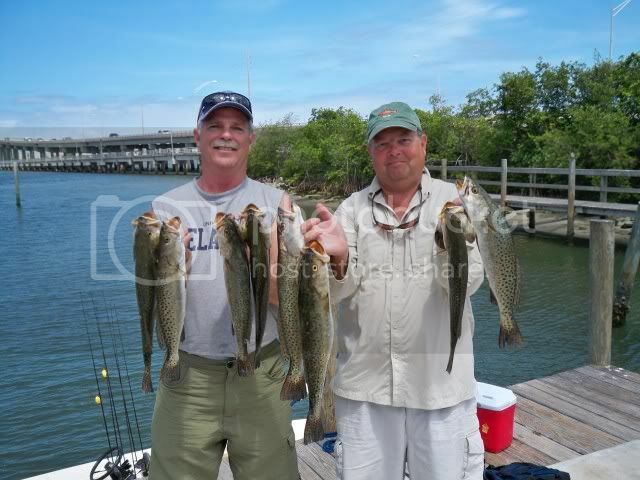 Steve and Ken with a limit of trout on the Indian River this week. Summer weather patterns have arrived on the Treasure Coast. Great mornings rewarded us with some fantastic fishing opportunities around the Indian River. It was a short spring, but who can complain after the winter we endured. I will certainly take the heat over the cold....anyday! I was out helping out for the Teen Angler championship tournament the past Sunday. We always have a great time and the kids make it a worthwhile volunteering cause. I had Ariel Vance on my boat and was impressed with how his fishing skills have improved since his first trip I had with him. 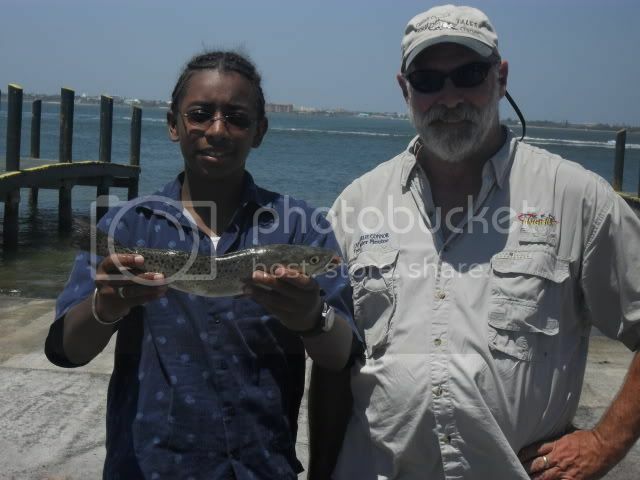 Fishing was tougher on most species, but Ariel caught two trout to give him second place in the tournament. Congrats Ariel and to all the Teen Anglers this year! I managed a couple hours of scouting the river later this week and was joined by Gary, Steve and Sarah for an afternoon of fun fishing on the grass flats. 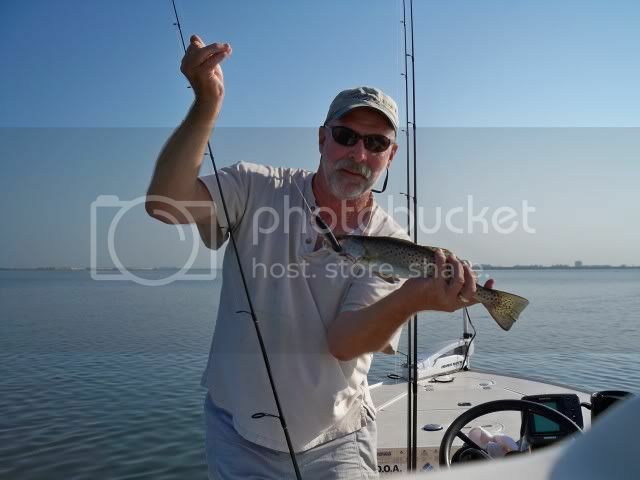 They found a variety of fish biting including a few very nice trout for dinner. I found snook and redfish hanging around the docks south of Fort Pierce. On the grass flats, find the bait schools and the trout will be nearby. On the docks, I used a DOA shrimp in the new Arkansas Glow color. It's a great color. Both redfish, trout and snook will devour it. We used the Deadly Combo and live shrimp on the flats for mid-day trout fishing and had good success out there. Harbor Branch, Queen's Cove and the west shore south of Fort Pierce have all been good for trout. Mark Amorello reported having good success with a MirroDine around some of the Fort Pierce docks this week. Bernie emailed me a report of catching an early morning slam at Harbor Branch on top water lures recently. It's been great fishing weather out there! 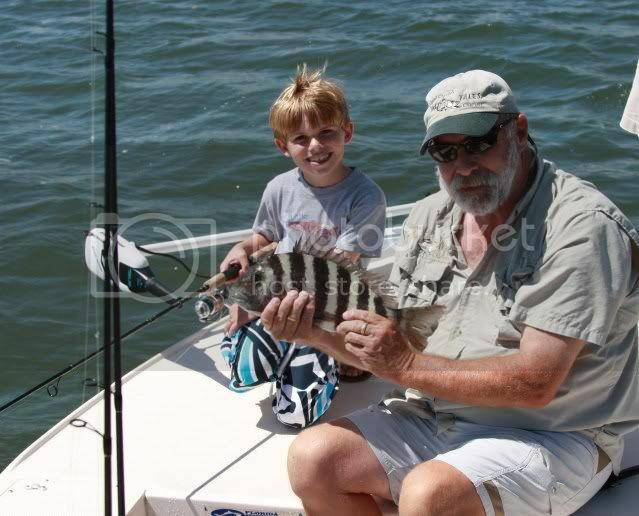 Bridge fishing has been slower lately, but you can still catch sheephead and a few bluefish on the catwalks. Mackerel are around the river and inlet area and the big jacks are cruising all over the river now. What might look like a school of mullet could very well be some 6-8 pound jacks or larger. Might not be a good fish to eat, but they will sure give a great battle on light tackle. There is bait all around the river now and if you fish the bait school, you can find the predators hanging nearby. I always love fishing in May on the Treasure Coast. If you haven't noticed lately, there are lots of new signs being placed all over the river marking the slow, idle and manatee zones. There are not any new zones around the area, but the old ones are being marked well. It might be fair warning to obey all signs when traveling around the river. They aren't being placed for no reason and you can expect that enforcement will happen. Ignorance is generally not an acceptable reason for not complying with regulations. Be safe and have a great summer out on the water!